This website is provided “as is” without any representations or warranties, express or implied. Christian Plumbing & Tile, Inc. makes no representations or warranties in relation to this website or the information and materials provided on this website. No recipients of content from ChristianPlumbingandTile.com should act or refrain from acting on the basis of any content included in ChristianPlumbingandTile.com. ChristianPlumbingandTile.com expressly disclaims all liability in respect to actions taken or not taken based on any or all the contents of this Website. Any information sent to us by Internet e-mail or through ChristianPlumbingandTile.com is not secure and is done so on a non-confidential basis. Your communications with this website may be susceptible to data corruption, interception and delays. Confidential or Time-Sensitive information should not be sent through email. 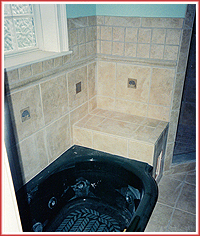 Transmission of information from ChristianPlumbingandTile.com does not create a client relationship or contract of any kind, nor is it intended to do so. The transmission of ChristianPlumbingandTile.com, in part or in whole, and/or any communication with us via Internet e-mail or through this site does not constitute or create a client relationship between us and any recipients. Your use of this Web site is at your risk. The information on this web site is provided to you “as is”, for informational purposes only, without warranty of any kind, including any implied warranty of merchantability, suitability for a particular purpose, non-infringement, accuracy, or completeness. Christian Plumbing & Tile, Inc. will not be liable for any damages including direct, indirect, incidental, consequential, or punitive, arising out of your access to or use of this website. Christian Plumbing & Tile, Inc. does not warrant that this website or the servers making this site available are virus free. The information contained on this Web site could contain technical inaccuracies or typographical errors, and information may be changed, updated, and/or deleted without notice. Neither Christian Plumbing & Tile, Inc. nor any of its directors, employees or other representatives will be liable for damages arising out of or in connection with the use of this website. This is a comprehensive limitation of liability that applies to all damages of any kind, including (without limitation) compensatory, direct, indirect or consequential damages for, loss of data, income or profit, loss of or damage to property and claims of third parties. This Web site may contain links to other sites. Christian Plumbing & Tile, Inc. has no control over the information and privacy policies and practices of those Web sites, and is not responsible for their content, collection and use of information, or freedom from error or viruses. It is your responsibility to recognize, by paying attention to your browser’s address bar, when you are leaving the Christian Plumbing & Tile, Inc. website. Christian Plumbing & Tile, Inc. provides links to you only as a convenience, and the inclusion of any link does not imply endorsement by Gerdes Construction,Inc. of the website. Christian Plumbing & Tile, Inc. considers the responsible use of personal information to be a critical element in enabling the Internet to reach its potential as a serious tool for personal and professional activities. As the Internet changes our lives in a number of ways, we are committed to respecting your privacy. In general, you can visit this web site without telling us who you are or revealing any information about yourself. Our Web site tracking software collects the domain names but not the email addresses of visitors. We analyze this data for certain trends and statistics, such as which parts of our site users are visiting and how long they spend there. In general, we do not link your IP addresses to anything personally identifiable to you. We use this information to measure the use of the site and improve the content delivered on the site. In those cases where session information is not anonymous such as information you submit pursuant to the registration and inquiry submission processes of our web site which require you to give us contact information (like your name and email address) and unique identifiers (like passwords) such information is seen only by our staff. We use customer contact information only to send you information you have requested. No personal information is ever sold, rented or otherwise distributed to any third party. If you have any questions or comments about our privacy practices, or would like to correct or update information provided to ChristianPlumbingandTile.com via its Web site, please contact us.